Editor’s note: This commentary is by Melody Walker Brook and Mike Plante on behalf of the Elnu, Nulhegan and Koasek Bands of the Abenaki. In many people’s minds, the blessings of a bountiful life in a place like the United States of America were made possible by the exploration and colonization ushered in by Christopher Columbus. However, this view is only one story of many. This continent was filled with hundreds of unique civilizations — sovereign nations comprised of millions of indigenous peoples, the original inhabitants of these lands. Those millions were forced to accept devastation as the price for someone else’s dream. The European conquerors brought with them virulent diseases, ideological warfare and the seeds of manifest destiny. As Robin Wall Kimmerer so eloquently stated in “Braiding Sweetgrass,” “And then they met – the offspring of Skywoman and the children of Eve – and the land around us bears the scars of that meeting, the echoes of our stories.” To understand how a land was won, equity mandates that one also recognize that for someone else, it was lost. When the values that necessitated struggle rather than cooperation met with might, suffering was left in its wake and for this reason Columbus Day has always been a day of mourning for indigenous people. As human beings, we all have frailties and fears, but we also have the ability to recognize them and aspire to a higher standard. The original inhabitants are the ultimate conscience of this continent and the modern nation state has yet to look at those faces and come to terms with its past. Christopher Columbus not only launched European dominance in the Americas but also held values that today can be considered abhorrent — from the claiming of slaves and women’s bodies to the very idea that he could not recognize them as fellow human beings. While we can understand that these practices were common “in their time,” we can also recognize that they were, and certainly still are, wrong. How can a country heal and move past the injustices of history when a person with these values is honored in today’s society and the deleterious effects are still being felt? It is a willful abrogation of awareness and acknowledgement. The Elnu, Koasek and Nulhegan Bands of Abenaki people would like to formally state that these are not our values and we wish to encourage a more complete understanding. The proclamation of Vermont Gov. 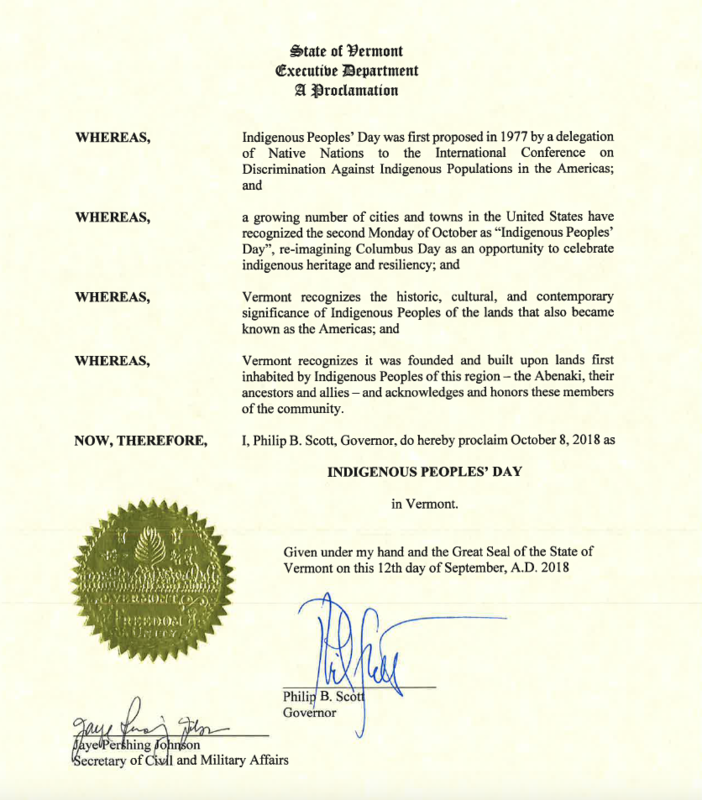 Phil Scott recognizing Indigenous Peoples’ Day in 2017, reaffirming the previous year’s action by Gov. Peter Shumlin, is a strong affirmation of movement in a better direction. During the centuries of colonization that followed Columbus’ arrival, indigenous people have experienced the scourges of virgin-soil epidemics, chattel slavery, missionization and cultural genocide, outright extermination, “righteous” warfare, reservations, the boarding schools, eugenics programs, termination policies, the imposition of blood quantum rules, and continuous attacks on sovereignty, religious freedom, and the pursuit of happiness. This onslaught continues. 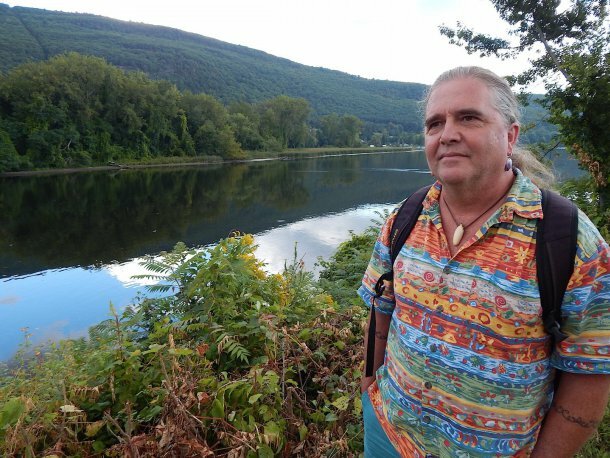 Environmental destruction that others have refused to accept continues to be imposed on their lands, such as the Dakota Access Pipeline, with other compromising energy infrastructure projects planned even here in the Northeast. The image of dogs attacking indigenous people at Standing Rock, juxtaposed with the use of dogs during the era of Columbus as described by Bartolome de Las Casas, begs the question: When does it end? Sacred places are still destroyed to turn a profit. When religion is not found in a book but in a place and those places are destroyed or sites are rendered inaccessible, is there religious freedom for all? Indigenous people continue to exist in their Eden, yet experience an ongoing onslaught from those thrown out of their own. The effects are long-lasting and continue to surface across indigenous country in the form of alcoholism, substance abuse, poverty, missing and murdered indigenous women, extremely high suicide rates, and a host of other issues. Racialized mascots continue to exist – stereotyped caricatures that are not reflective of real human beings – a projected idea of a people rather than who they are in actuality. Where can spirit exist in all of this? Is it possible to move forward from the degradation of the past into a place that restores and reinforces our spirits? The “gift” of civilization, as posited by the European arrivals and forced upon indigenous people throughout the era of colonization, we would like to formally decline. Rather, we invite you this year and going forward to put on your Abenaki glasses and see the world from a different perspective. Removal of a day to honor Columbus is a major step toward recognizing indigenous humanity and the validity of our cultures. Perhaps if mainstream Americans can begin to see the beauty of original peoples, our cultures and our unique ways of looking at the world, we can we move into a place of healing and community building — together. 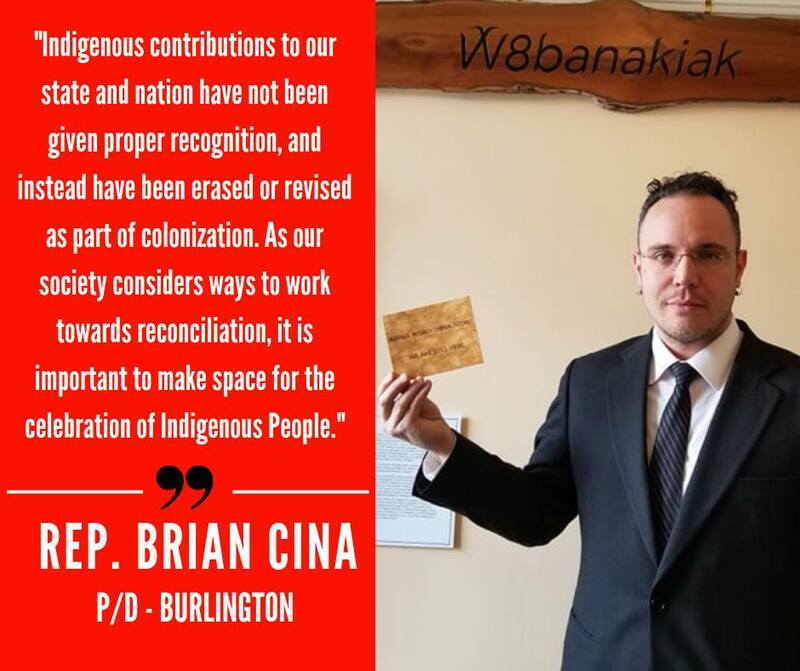 The replacement of Columbus Day is not rewriting history – what has happened has happened – it is an acknowledgement of the cost this “progress” has had on the indigenous populations. This is a day to affirm indigenous peoples and a day to mourn those people, human and non-human, that suffered. 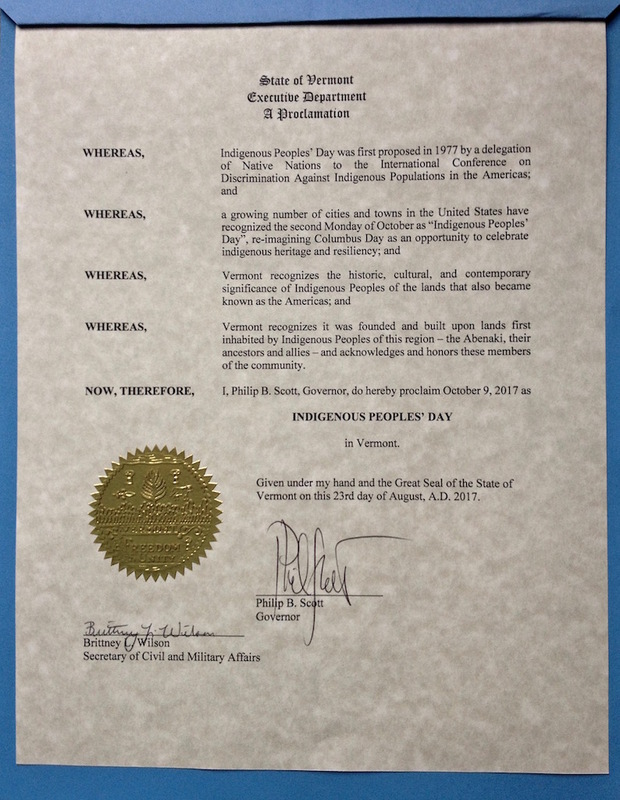 Therefore, the Nulhegan Band, Koasek Band and Elnu Band see Indigenous Peoples’ Day as a time to reflect upon what has been lost but also as a formal exclamation to the world that we are still here. We have value and resilience. Much can be learned from the more than 500 nations that continue to exist on this continent. One of Columbus’ first acts as he landed in someone else’s homeland was to lay claim through right of discovery and to rename as a form of ownership. Indigenous Peoples’ Day is an acknowledgement that he failed. We still remember the names of these places and our relations and we have not forgotten our own name. For those outside of our memory, the mission remains to bring them home. This is still our homeland and the bones of our ancestors speak to us. Nialach! May it be so.